Do you ever avoid making a dish you love just because it is a lot of work? I know I sure do 🙂 Here is a traditionally fiddly dish, transformed to be completely simple. Just as good, WAY less work, and definietly just as YUMMY! 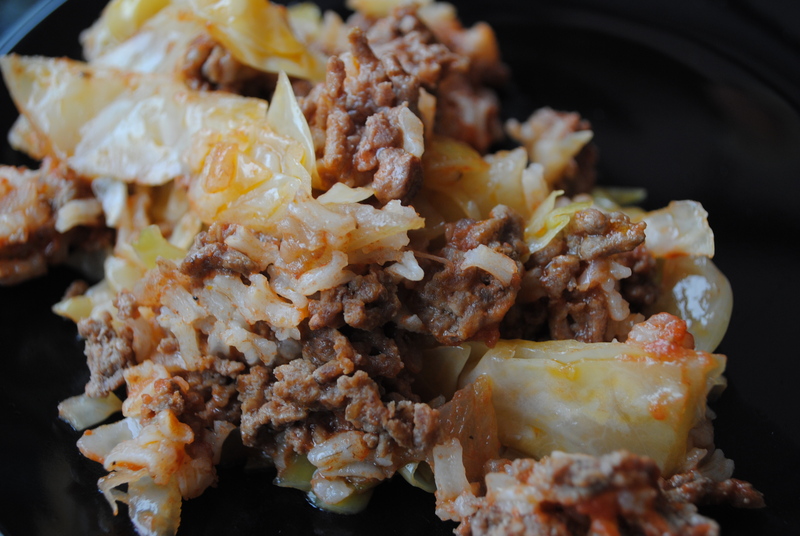 Once meat is browned along with the onion, and rice is cooked, combine them together and add the tomato juice. Next, in a medium casserole dish, spread 1/2 of the shredded cabbage on the bottom of the dish, then top with 1/2 of tomato/meat mixture. Make another layer of cabbage and another of meat. Put the lid on the casserole, and bake at 350 degrees F for about an hour, or until the cabbage is fork-tender. Serve alongside fresh French bread for a comforting fall meal. I’m not sure my kids will eat cabbage but I’m willing to try! My parents would have LOVED this recipe. I’ve been making this for over 30 years….but I use 1 can of crushed tomatoes, instead of the tomato juice and I also now add about 1/4 cup of salsa (homemade). I also make this dish, but with a little twist. I use uncooked minute rice and vegetable cocktail instead of tomato juice. This is the second recipe of yours i’ve tried… it’s just as amazing as the blueberry muffins! I doubled it no problem, and the only change I made was using 1 can of diced tomoatoes and 1 large can of tomato sauce since I didn’t have tomato juice. Delicious!